Syracuse, NY. Temple Adath Yeshurun, sanctuary. Percival Goodman, architect (1971), Dorothy Reister, sculptor. Photo: Samuel D. Gruber (2013). For readers in the Central New York area, this Sunday morning, December 8th, I'll be giving an illustrated talk at Temple Adath Yeshurun in Syracuse at 10:00 a,m, Admission is free. Come a little early for coffee and chitchat. The venue is special. Temple Adath is one of the last synagogues designed by modern master Percival Goodman, and it is also one of the very best - and certainly most striking - of modern buildings in Central New York. You don't have to be Jewish to be interested in synagogue architecture, and you don't need to be Jewish to want to visit this building. In the last hundred years, American Jews have built synagogues at a rate never seen in the world before, and in the process they have integrated the synagogue into the American landscape, and Judaism into the American cultural mainstream. This illustrated lecture explores the evolving form and meaning of American synagogue in the 20th century, shaped by architects and their congregational patrons. Through synagogue design, we trace changes in the organization of the American Jewish community and its relationship to American culture as a whole. The location, size, shape, and stylistic language adopted for synagogue designs throughout the century is a reflection of the changing needs and values of American Jews. Temple Adath has interest inside and out, and the entire plan - combining myriad practical and utilitarian functions with large worship, social and educational spaces - is worth study. Goodman is often noted - and I have recently done so myself (see recent post about Herbert Ferber and Ibram Lassaw) - for his signature design elements such as sharp angles, natural materials (especial brick and wood) and the abundant incorporation of modern art in his designs - but he also excelled as a site and facilities planner. He had a good sense of building siting, the relationship of parts for function and aesthetic and emotional effect, and how to develop interesting spatial progressions. The evolution of Temple Adath Yeshurun as a congregation, and as a series of buildings, is a good illustration of the development of American synagogues common throughout the country (I develop this theme further in an essay titled The Continuing Exodus written for an exhibition about urban synagogues a few yeas back). 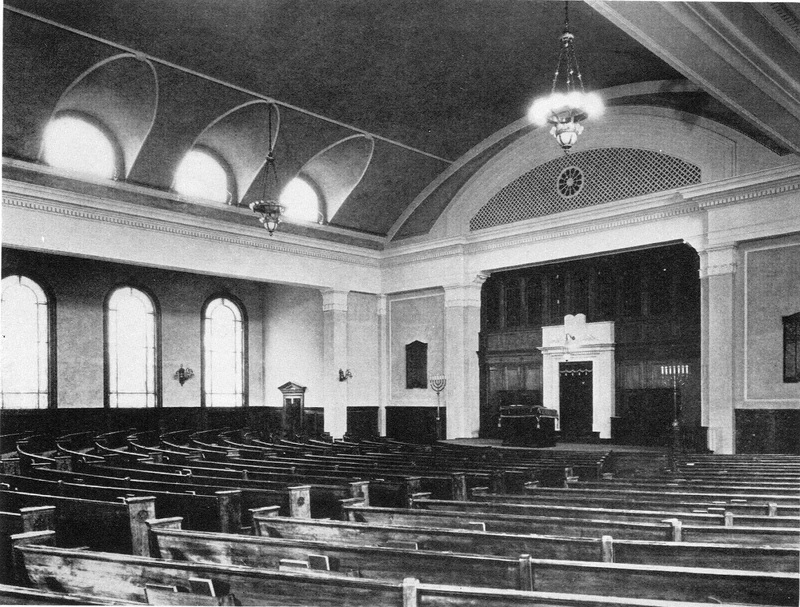 Temple Adath was an offshoot in 1870 from an existing congregation (New Beth Israel, commonly known as The Grape Street Shul). 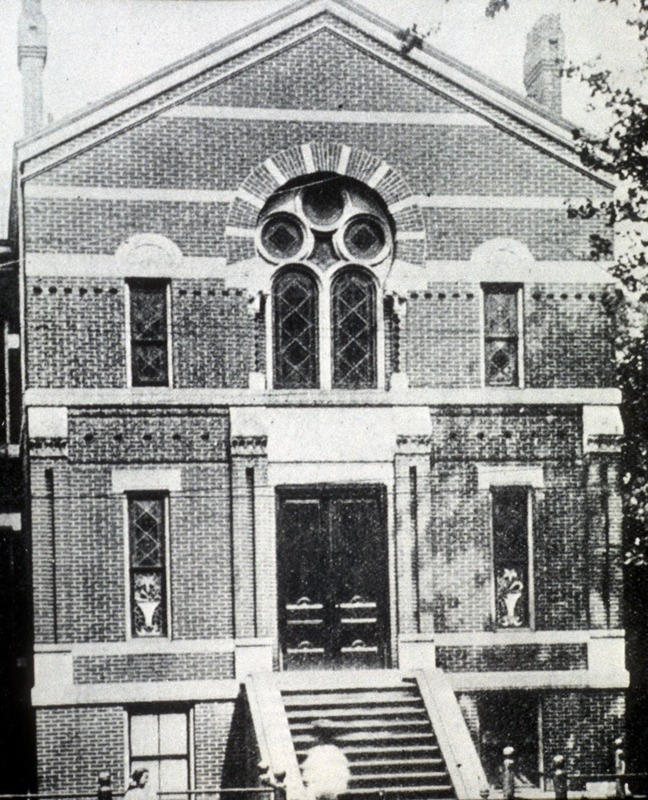 Congregation Adas Yeshurun received a New York State charter in 1872, and the members then bought a house o Mulberry Street to use as a place of worship. They erected a new building on the site in 1878. This building remained in use until the congregation moved in 1922 to an imposing classical structure (designed by Gordon Wright) slightly further east on South Crouse Avenue and Harrison Street (now the Hotel Skyler). At that time the name was changed to Temple Adath Yeshurun. Fifty years later, in 1971, the congregation dedicated its present home on Kimber Road at the eastern edge of the City of Syracuse. Design by Percival Goodman, it includes impressive ritual and decorative artwork by Dorothy Reister. 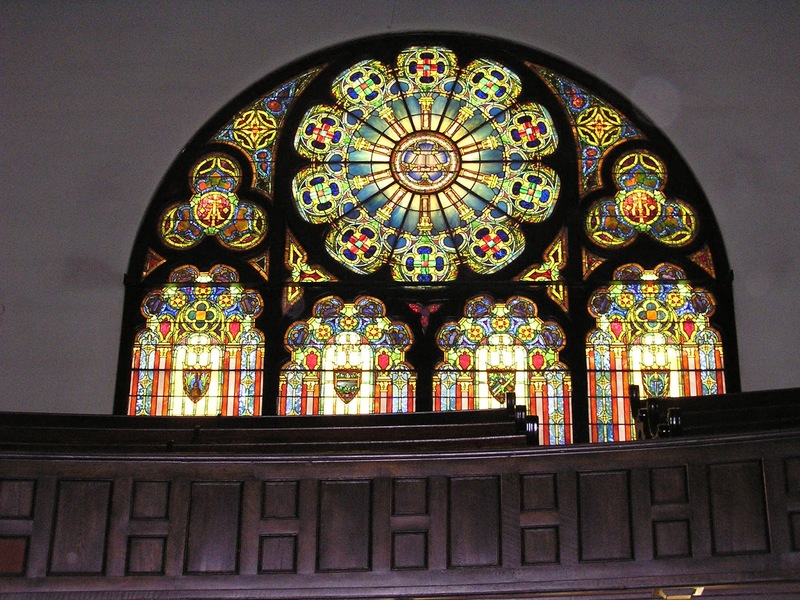 Some of the stained glass window panels from the 1922 building were moved and installed at Kimber Road. Syracuse, NY. Temple Adath Yeshurun, chapel. Percival Goodman, architect (1971). Photo: Samuel D. Gruber (2013). For more information, call the Temple Adath office at (315) 445 – 0002, email info@adath.org, or visit www.adath.org. Syracuse, NY. former 201 Wolf Street. Wolf Street Office, First Trust & Deposit, 1929. Photo: Samuel D. Gruber 2013. As a follow up to my recent post on the Art Deco Grant School, let me bring attention to a much smaller, but more charming example of Northside Deco at 201 Wolf Street, on the NW corner with North Salina. 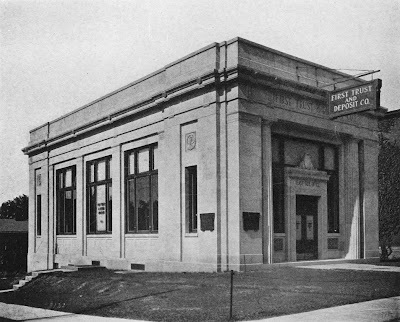 This is the Wolf Street Office of the First Trust & Deposit Co., the last in a series of branch offices the bank opened in different neighborhoods across the city after its creation in 1919 through the merger of The First National Bank of Syracuse and the Trust & Deposit Company of Onondaga. These branch offices were an early version of what we now recognize as chain stores - where each store or office has similar architectural features to create brand recognition. Drugstores and Five and Dimes were doing the same thing - but in a different style. Generically, almost all banks of the first decades of the 20th century had this branding feature - since they favored the stately classical style that linked banking to the broader civic culture. Government buildings, libraries, and schools also often adopted classicism, especially after the success of the 1893 Chicago Exposition (the White City) and the spread of the "City Beautiful" Movement. Architectural "branding" was nothing new. The main building of First Trust & Deposit is also classical - a huge Downtown Roman temple at 201 South Warren Street; now Key Bank. The building was erected in 1915 and then doubled in size in 1928. 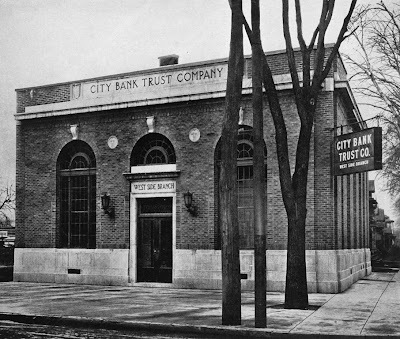 As far as I can tell the establishment of First Trust & Deposit offices in neighborhoods - taking banking to the people - was something of an innovation in Syracuse at the time, though Melvin L. King also designed at least one branch (is it still extant?) for the City Bank Trust Company (see photo below). Elsewhere in America branch banking - with scores of branch buildings - was common for big banks in the period after World War I. The first four First Trust & Deposit branch offices are all designed as nearly identical classical style structures by leading local architect Melvin L. King, but the Wolf Street branch takes a stylistic departure. It is built of brick and glass, with its facade and especially its entrance portal decorated with lively Art Deco motifs. Is it also a product of King's office - but just a stylistic upgrade? I hope a little research in the archives of King + King will tell. Syracuse, NY. First Trust & Deposit East Side Office (still extant facing Loguen Park). Photo from Melvin L. King : Architect. (Syracuse: Architectural Catalog Co., 1925). Syracuse, NY. 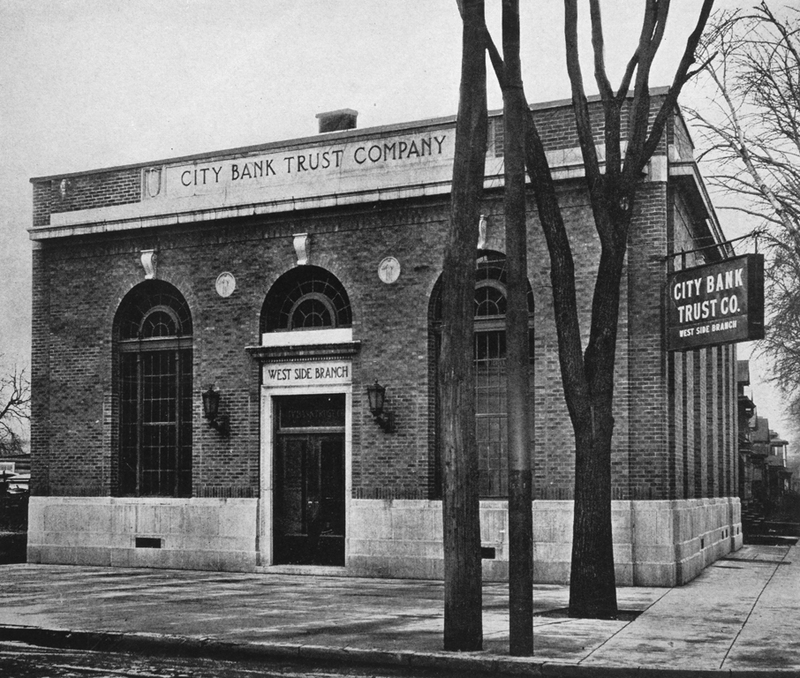 City Bank Trust Company, West Side Branch. 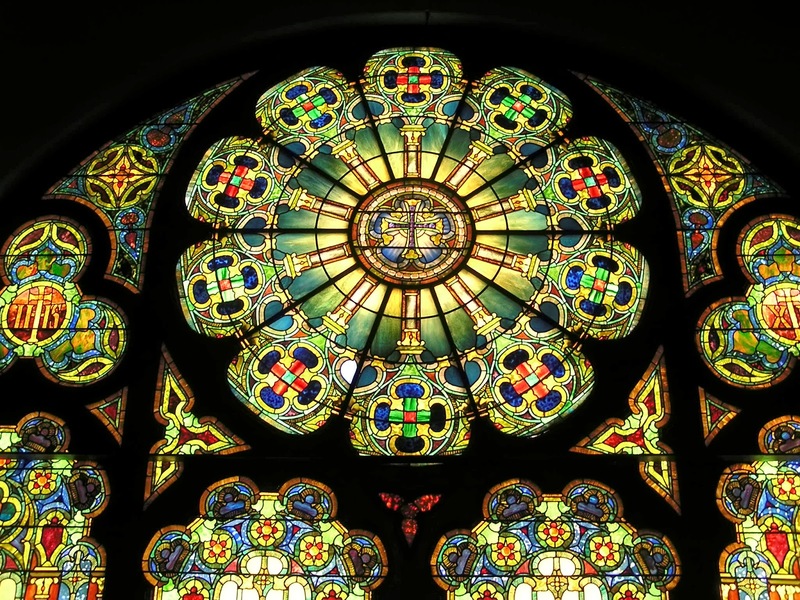 Photo from Melvin L. King : Architect. (Syracuse: Architectural Catalog Co., 1925). We are fortunate that the building found new life as Brian's Fine Art Gallery & Custom Framing, operated by Brian Wood who has beautifully maintained the building - inside and out. Other 1920s banks have not fared so well. Word is, however, that the building will soon be listed for sale. The little bank sits on the center of an historically and architecturally rich intersection. This was the heart of the old commercial area of Salina - first the village laid out by James Geddes, beginning in 1798, and then later, after its merger in 1848 with Syracuse to create the modern city, of the old First Ward. By the late nineteenth century the are was more industrial. The Moyer Carriage Factory (now the Penfield Building) was located just behind the bank site, and Kearney's Brewery was across North Salina (where the new Family Dollar recently opened). Streetcar lines ran on North Salina and Wolf Streets and the main terminal and car yards of the People RR company of Syracuse were at Wolf between Fourth and Fifth North Streets. Syracuse, NY. North wall of former Wolf Street Branch of First Trust & Deposit, with view of Penfield (former Moyer Carriage) building in rear. Photo: Samuel D. Gruber 2013. Syracuse, NY. 200 block of Wolf Street looking north. In the center is former Engine House #4. Photo: Samuel D. Gruber 2013. The 1600 block of North Salina Street and the 200 block of Wolf Street still preserve some of the oldest non-residential structures in the area. Some of these buildings date to the last quarter of the nineteenth century once housed grocery stores, dry-goods establishments, taverns, and cooper shops. Immediately to the west and north of this intersection Harvey Moyer developed his carriage factory (in what is now the Penfield Building), and then later his automobile works in three large buildings erected on with side of Park Street between Hiawatha Boulevard (formerly Free Street) and Wolf Street. (see below). Visit Brian's Art Gallery, the nearby Antiques Exchange on North Salina Street, and take a walk up Wolf Street. Then head a block east to Washington Square and look at the Kirkpatrick Monument, or head west to the Regional Market. I didn't make it to Italy this summer as I had hoped, so instead I've kept my eyes open for Italianate style houses around Syracuse. 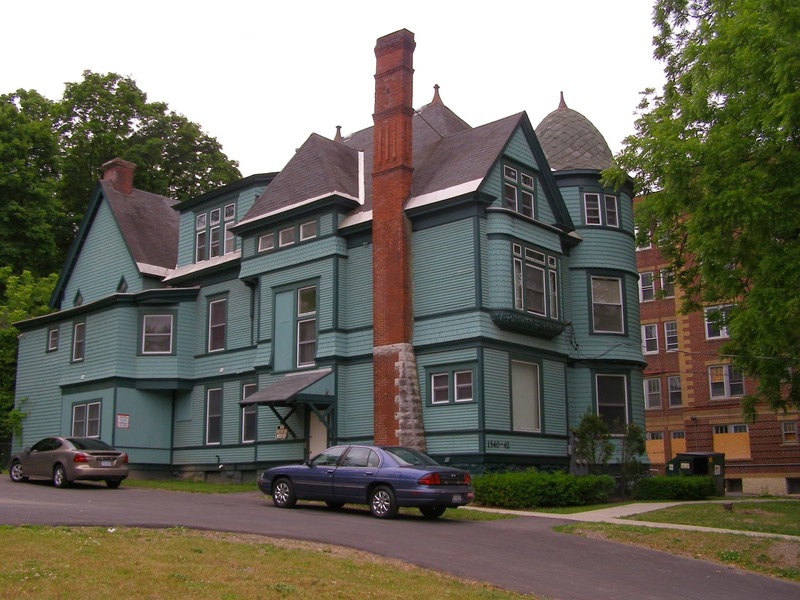 These include some of the oldest and most distinctive structures on the Eastside of Syracuse; cube-like houses that are still scattered throughout the thousands of other later residences. 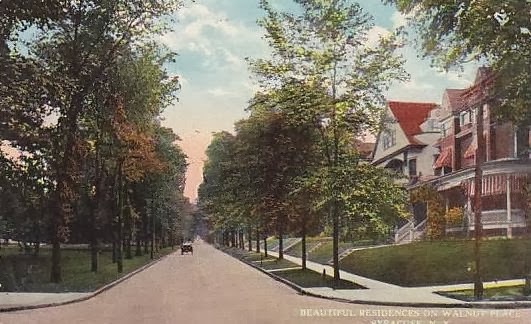 These houses, built mostly in the third quarter of the nineteenth century, pre-date Syracuse's suburban expansion to the East and the laying out of the new residential grids that mark the first new residential developments. Thus, the Italianate houses quickly tell us where the old roads were. The houses mostly faced major travel routes, and these also often indicate the locations of prosperous farms, all of which, like the Scott Tract (later developed as Scottholm) were subsequently built over, especially from 1880 through 1930. This phenomenon is hardly unique to the Eastside; the process can be traced on all sides of Syracuse. The further one travels from the modern city on the old pre-automobile routes, the more Italianate houses one finds still in relative pristine isolation. To my knowledge there is no list of all of these buildings, and certainly no detailed architectural or photograph record. When the historic preservation movement began in Onnodaga County in the late 1960s and 1970s some of these buildings were noticed and celebrated, but more attention was given to the late eighteenth and early nineteenth century buildings in Federal and Greek Revival style. While many of our local historical societies have information on their Italianate houses, these have not been collated. there are probably several hundred Italian houses still extant throughout Onondaga County. While most of these houses are not designated either local or National Register protected sites, a good number are well preserved. In areas like the Northside of Syracuse where the largest number of urban Italian houses survive, these are mostly owned by absentee landlords, and many (like the Catherine Murray House) are not well maintained. On the Eastside, where we find Italianate houses on East Genesee Street, Salt Springs Road and South Beech Street - all old roads - the buildings (or at least their exteriors) have fared better, though the landscapes over which they once presided have been very much compromised. Streets have been widened and so the houses sit closer to the road than originally intended. In some cases (1924 East Genesee) there are now paved parking areas instead of front lawns or walkways, and the Italianate at 309 Columbus is hardly recognizable beneath its recent vinyl siding. Many of the Eastside Italianate houses still have their distinctive square cupolas. Additions to buildings, however, have changed appearances somewhat. 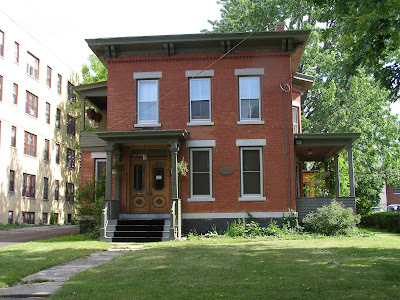 But even early on many Italianate houses were enlarged, usually with front porches and rear additions, as can be seen on the Scott House at 2686 East Genesee Street. What we now call the Italianate Style evolved from the earlier Italian Villa Style, a widespread American rural and suburban residential architecture popularized by Alexander Jackson Downing. A popular residential style, it was the most common architectural “high” style for a well-designed house in the mid-nineteenth century, especially in the 1850s and 1860s. Urban versions more closely copied Italian Renaissance palazzi while rural and farm versions were loosely based on Italian (mostly Tuscan) villa forms. Italianate houses could be built of wood, brick and even stone, and are easily recognizable by their distinctive cube-like shape, and their overall formal regularity of fenestration and applied architectural ornament. Italianate houses are usually two and occasionally three stories high, square or rectangular in plan, with low-pitched hip, gable, or shed (roof with one slope) roofs. Ornamentation can be of pressed metal, stone, or wood ornamentation, or wood with wood ornamentation. The most distinctive feature of nearly all Italianate houses is a cornice supported by brackets ("bracketed cornice") and decorative, projecting window "heads" (above openings). Ornamentation of more elaborate brick or stone houses, sometimes includes quoins and window decoration that varies from floor to floor. A recessed doorway is common. Later versions of Italian houses could be more rectangular in plan (with the shorter side facing the street), and these could also be slightly taller, and often included projecting side window bays - all elements that lessened the geometric purity of the cube, and added some variety and a hint of dynamism to the plan and exterior elevation. In some cities (but only rarely in Syracuse) these were built in rows creating blocks of urban multi-story connected town houses. Italianate houses are especially common in Central New York, since so much of the region underwent rapid and prosperous development during just those decades when the style was most popular. These houses once filled the downtown residential streets of Syracuse, and fine examples can still found on many of the roads leading into the city and on the main routes between towns and villages. Italianate farmhouses stood close to the road (though not as close as they often seem today, since so many old highways have been widened). They opened onto lawns, gardens on the sides and farm fields and pastures in the rear. Carriage houses were often in the rear of more urban Italianate residences, while barns and other buildings were in the vicinity of the rural houses. Italianate houses exuded a sense of solidity and dignity typical of the pre-Civil war era that emphasized civic-minded striving and persona modesty and family thrift. 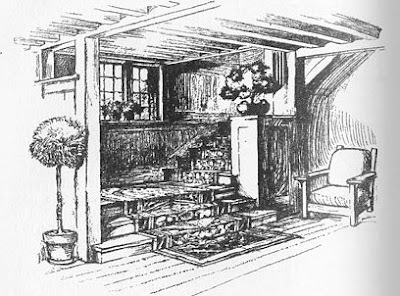 This regularity of form – some would same predictability – would be upset in the economic boom period of the next generation with the often exuberant experimentation of the Queen Anne style when asymmetrical forms, varied roof lines and mixed siding material and colors created a dizzying array of houses forms. Italianate was also favored for commercial buildings in the late 19th Century. Syracuse, NY. Scott House, 2686 East Genesee Street, ca. 1860. Photo: Samuel D. Gruber 2012. The Italianate style Scott family farmhouse, built ca. 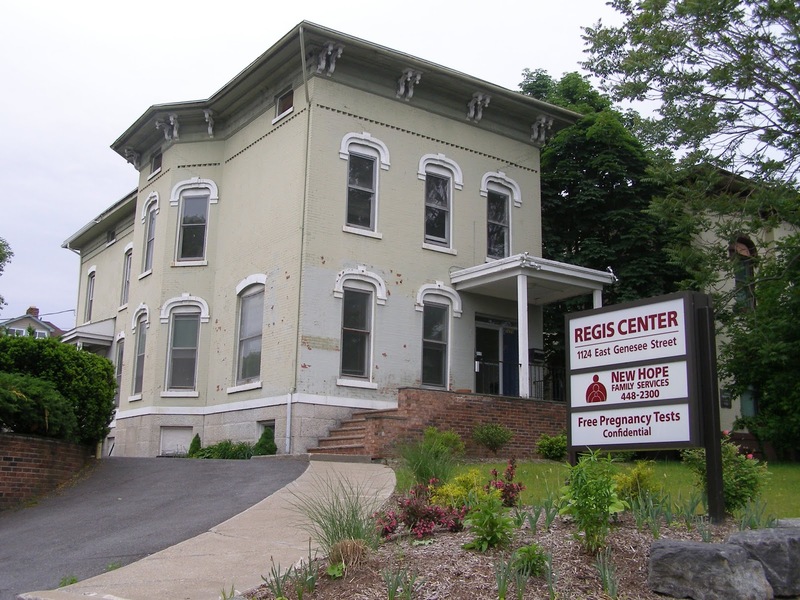 1860, is located at 2686 East Genesee Street at the southwest corner of the intersection of Scott Avenue and East Genesee Street. The homestead was owned throughout much of the 19th century by Benjamin Scott, and he lived in this house until his death in 1910. Amon Sanderson of the East Genesee Extension Corporation bought the entire tract and developed it as “Scottholm Estates.” The house is what is left of the farmstead for which the subdivision was named. According to a 1916 newspaper article, the Scotts used the house as an inn for travelers on the Genesee Turnpike (now East Genesee Street). The house was sold to Amon Sanderson in 1914, and then sold to and remodeled by E. A. O'Hara in 1915. O'Hara's father was publisher of the Syracuse Herald and the younger O'Hara eventually became publisher of the Herald-Journal. O'Hara electrified and “modernized” the house, which stayed in the family until 1969. (n.b. This post was updated on January 29, 2014. The names of archtects were added). 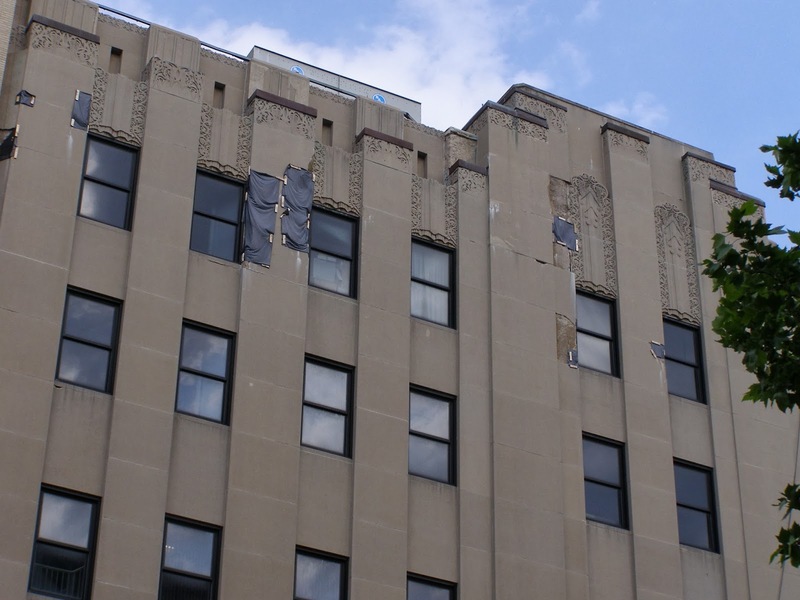 When one thinks of Syracuse's architectural contributions to the Art Deco or Art Moderne styles, the Niagara Mohawk (now National Grid) building always demands first (and sometime only) attention. It is our most spectacular building, and one that perfectly melds style to message. Like the Chrysler Building in New York, it is one of a handful of iconic American commercial buildings of the 1930s. But Syracuse has much more to offer in Art Deco and Art Moderne. During the boom years of the late 1920s and even in the first years of the Great Depression, private and public projects continued - albeit at a much slower pace and often plagued by funding and labor problems. Building really didn't peter out in Syracuse until about 1932-33 when previously planned projects were completed, and no new projects were begun. I've been looking at a lot of these buildings and will attempt to post about them to make them better known. Few are included in any architectural guides, so local residents, visitors and scholars are hardly aware of their existence - or hardly give their history and architecture much thought. For me, the greatest - or certainly the biggest - of these Art Deco delights is the Grant School on Grant Boulevard and Kirkpatrick Street on the Northside. Completed in the fall of 1932, it was one of several schools built or planned to alleviate massive school overcrowding at the time, but budget constraints kept it closed until the new school year began in September, 1933. The new Grant Junior High School, built in a very modern style we now call Art Deco, replaced the former Grant School on 2nd North Street between Danforth and Kirkpatrick, that had opened in 1898 (and still stands). Charles Colton was the architect of the earlier school, and prolific school architect James A. Randall designed the new Grant School. In the late 1920s and early 1930s the Syracuse City School District was overwhelmed with record enrollments. Despite new buildings erected in the 1920s (such as Nottingham High School opened in 1924), every school at every level was overcrowded by 1930. Publicly funded school construction was one area where building was needed and continued after the 1929 stock market crash. Mayor Marvin saw school construction as a way to alleviate unemployment - and even advocated hiring two separate crews to work alternate weeks at Grant - but was overruled because this would be more expensive. Preference was given to local contractors. The new building was of brick and what appears to be cast stone combined in a warm color pattern of orange and beige. The three-story building is framed with two heavy tower-like corner pavilions and has a large projecting entrance bay, all of which are articulated in what appears to be cast (concrete) stone resembling carved limestone blocks. The tops of these and the central entrance bay are decorated with lively relief work, combining geometric shapes and patterns with stylized floral designs - all typical of Art Deco architectural decoration of the period. In between are flat walls of brick punctuated by large classroom windows. To the sides of the main entrance are carved brackets supporting window lintels. These depict a monkey wearing clothes gathering nuts or fruits which could be symbolic of children gathering knowledge or a sly reference to the theory of evolution and the 1925 Scopes (monkey) trial. On another bracket is an eagle with a small nestling (?) at its feet, also by a similar nut or fruit tree. These and other decorations of the school building deserve closer scrutiny. Go take at look! see: "Economy in School Budget May Keep Grant School Closed Till September, 1933," Syracuse Herald (October 9, 1932).